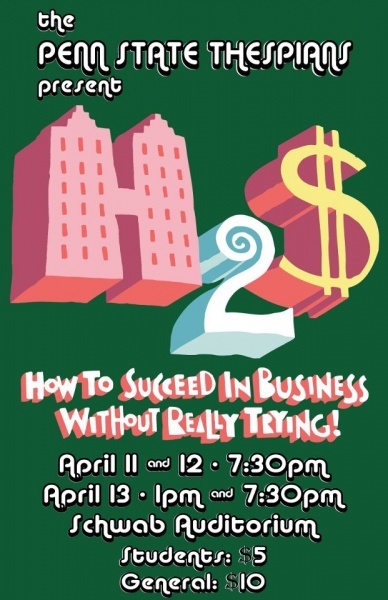 Penn State Thespians present "How to Succeed in Business Without Really Trying!" Comments Off on Penn State Thespians present "How to Succeed in Business Without Really Trying!" Hey all! Next Thursday-Saturday (April 11th-13th), the Penn State Thespians club, will be officially commencing their much awaited performance of Frank Loesser’s “How To Succeed in Business Without Really Trying”. You can officially buy tickets at at Eisenhower Auditorium, the HUB, or at the Downtown State Theatre. Tickets can also be purchased on the day of the performance at Schwab’s ticket office in the lobby. You can also purchase tickets, by clicking HERE. Prices are $5 (with student identifcation) and $10 for general admission. …and while you’re at it, RSVP to the official Penn State Thespians Facebook event! SPA's L.E.A.D Team Hosting A ROLLER RINK on March 18th!